I am fortunate to work within the pre-existing infrastructure through the University of Maryland Institute of Human Virology Center for International Health, Education and Biosecurity (CIHEB) at the University Teaching Hospital (UTH) in Lusaka, Zambia (that’s a mouthful!). CIHEB has worked in Zambia for over 12 years implementing multiple projects, primarily involving the HIV epidemic. More recently, the group developed a Medical Education Partnership Initiative that trains Zambian physicians in advanced HIV medicine and infectious diseases. 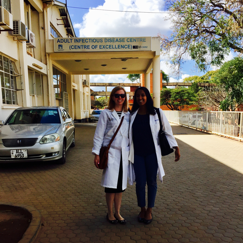 For the past two summers, I have traveled to Lusaka with an interprofessional group of learners to work on the ongoing efforts to implement antimicrobial stewardship at the hospital. The learners participate in projects that help us quantify and describe antibiotic utilization at the hospital. The data gathered from these projects informs areas for potential intervention and facilitates development of institution-specific antibiotic guidelines and antibiograms. We hope to continue to build on these efforts with each return trip and serve as a resource to the ID physicians and pharmacy team at UTH, who are continuing to lead stewardship on-site. At this point, most of our efforts have been laying groundwork to determine how to prioritize interventions moving forward. We have identified a lot of challenges but also a lot of areas of opportunity. The need for stewardship in low and middle-income countries is huge, but the challenges faced in implementation are significant. How can you enforce restrictions on certain drug products when they may be the only available products for a patient that day? What do you do when the hospital is out of blood culture bottles so you cannot obtain diagnostic information? We are very fortunate in the US to have access to not only a wealth of antimicrobial options, but also rapid and accurate diagnostic tools. No formalized impact has been measured yet. Our primary initiative for this upcoming summer is to work with the Department of Pharmacy to identify a reliable metric for quantifying antibiotic consumption at the hospital by piloting a system we developed on our previous trip using their inventory stock cards. We hope this will allow us to have some consumption data that could be used to assess the impact of formalized antimicrobial guideline implementation and education efforts down the road. Providing open-access training and education materials is an important way to expand the reach of stewardship globally. Tools such as the antibiotic prescribing form from the South African Antibiotic Stewardship Programme (www.fidssa.co.za/saasp) can be implemented in other countries and prevent reinvention of the wheel. I would love to see the pharmacists at UTH leading stewardship. They have already implemented a carbapenem and vancomycin restriction policy and conduct prospective audit and feedback with these drugs. I think it would be great to expand on that model with other antibiotics! Effective communication is key – recommendations that can be made in person to allow for thoughtful discussion of the patient’s case are likely to be more effective than a behind-the-scenes phone call or page and likely lead to long-term trust between the steward and the prescriber.